John Pilmore was born c.1831 at Market Everton, Rutland , England . His parents were William and Anne (nee Bailey). When John and Mary arrived in South Australia they walked directly to Modbury, with Mary carrying William on her shoulders and John carrying what possessions they had, a journey of some 10 miles N.E. of Adelaide. The family had lived in a dugout on the banks of Upper Dry Creek, until their residence was erected on what is now the corner of Milne Rd. and Penny St. , Ridgehaven. In the assessment records for the District of Highercombe 1853 it stated that John rented a house from Mr. Howard Blyth on section 1575. In 1854 John and Mary’s second son George was born on the 7th of August. In1855 John and Mary moved from the house on sec. 1575 onto a 40-acre section, Pt Sec 1579 on Dry Creek, which he leased from Howard Blyth and Morphett. Their first home was a dug-out in a bank of Dry Creek with the stump of a tree as a table. It was at this time that they were joined by John’s elder sister, Eliza and brother-in-law, Thomas Goodman Rawlings and family. John as an agricultural labourer worked for Mr.Giles, carting chaff to Adelaide . As the years passed the Pilmores built their own home and had three more children, John, Richard and Rosanna. By 1865 they were leasing and farming the other 40 acres, the balance of Sec 1579.
. The Pilmores continued farming and by 1868 the assessment records stated that John was leasing 140 acres of land from Blyth and Cudmore on part Sec. 1579 and 1576. By 1873 records showed that he was both occupier and owner of that same land. When the Pilmores left the District in 1886 they had acquired 240 acres. In that 10 years George, John, Richard and Rosanna had all married and were having children of their own. 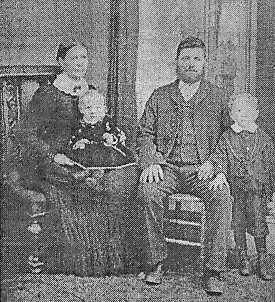 In 1886 John and Mary Pilmore left their farm and with some of their children, John, Rosanna, Susan, Voll and Edgar went to live at Gerang – Gerang in Victoria and pioneered farming in that district. Family legend states that Mary drove the wagon while John and their sons herded cattle through to Gerang-Gerang on foot, staying at Mt Monster siding (now Keith – SA) where John’s son Richard lived and worked as a ganger for the South Australian Railways. Over the years the family used Keith as a rest stop on their travels between South Australia and Victoria . .Through many years of hardship they managed to build up their farm at Modbury and to make a better life for themselves and their 8 children. Although he left S.A. he returned home and retired here. His children all prospered and some went on to farm both here and in Victoria . 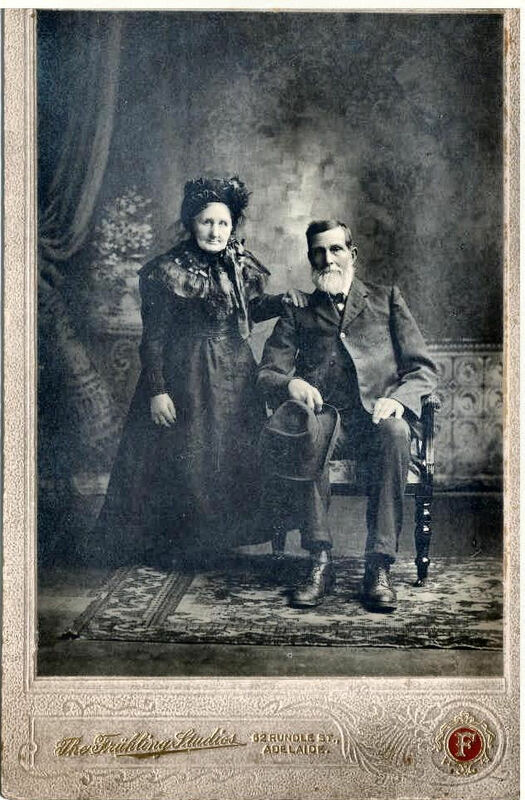 John and Mary Pilmore had Eight Children. William, born-c. -1852, England , died c.1865 Dry Creek Modbury. George, born -7-8-1854, Ladywood, Dist. Hig. -Died, 20-1-1941. Married Mary Ann Cook on 9-9-1878, Wesleyan Parsonage, Nth. Adelaide , Dist. Adelaide . Married Mary Fertch on 13-10-1881, Archer St , Nth. Adelaide. Dist Adelaide. Mary, died 27-8-1935, aged 77yrs, Dimboola Victoria . Richard, born 22-11-1860, Upper Dry Creek, Dist. Hig- died 26-10-1944. Married Louisa Anderson, (Widow formally Dickson). at the residence of S. Waylord, Adelaide , Dist. Adelaide on 30-8-1881. Rosanna, born- 22-4-1863, Upper Dry Creek, Dist Hig. Died -1950. Married Frederick Lokan, 8-5-1880, Lutheran Church , Adelaide , Dist. Adelaide . Susan, born -4-1-1866, Upper Dry Creek, Dist Highbury. Died – 8-9-1943. Married George Edward Keen on 9-11-1892, at the residence of William Keen, Charleston , Dist. Nairne. Volt, born – 24-7-1868, Modbury, Dist Highercombe. Died -3-6-1947, Murray Bridge . Married Agnes Jane Storer in Victoria in 1897. Edgar, born -15-5-1871, Modbury Dist Highercombe. Died -9-7-1965, buried Nhill Cemetery aged 94yrs. 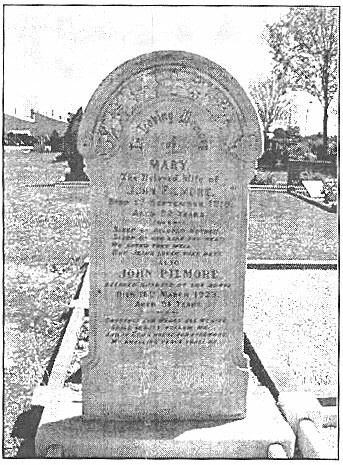 John Pilmore died on the l8th March 1923 and was buried at the Dudley Park Cemetery, South Australia. Mr. Brian Pilmore – Re-union and Family History notes and photos. The Tea Tree Gully & District Historical Society Inc. would sincerely like to thank Mr. Brian Pilmore for his kindness in supplying information on his family history. Assessment Records T.T.Gully Library – Family History Section. Birth, Death and Marriage C.D. South Australia and Victoria -City of Tea Tree Gully Library – Family History Section. Shipping Records, Pilmore and Storey family history, Victoria – Internet, City of Tea Tree Gully Library – Family History Section.